Mandy is 17 and pregnant. Jill's father has just passed away. Jill's mother decides to adopt Mandy's baby. Not only does Jill oppose, she resents Mandy. Their lives begin to get tangled in ways they both would not have expected and soon they must face problems they tried so hard to hide. The story is told through Mandy and Jill's perspective, each narrating in a different chapter. Zarr has been able to create two different voices that make the characters believable. It's not just changing the font but also the tone and perspective that allows us to see two totally different people. However, although Zarr succeeds in this area, the character of Mandy lacks features that an 17 year old would have. While I was reading it I felt like she was in her mid 20's, almost 30 because her voice was so much more mature and her thoughts made it seem like she had years of knowledge unlike Jill. Although, then again, Jill was portrayed slightly more childish. I guess because of Mandy's background, she may have been forced to grow up faster than usual and I'm pretty sure Zarr tried to explain that throughout the novel but it still didn't feel right. Also, as a reader, it was hard to create any attachments with either Mandy or Jill. I feel inclined to be more sympathetic to Mandy though, as her story unfolds. Jill just came across slightly annoying and lacked depth. Her character was just angry or sad with bursts of happiness most of the time. The only character I really felt for was Dylan but that slowly took a back seat as well. The plot was touching at moments, especially through Mandy's perspective but it was also predictable. A lot you could pick out after a couple of chapters. There are few shocks but it just flowed through most of the time. What I appreciated was how Zarr tried to explore the different relationships and how much some of it meant to a person, even if it never seemed like it. The ending was sweet as well, I liked how Zarr managed to tie off the entire story neatly. It left me feeling satisfied, which is usually how I like to feel after an ending. 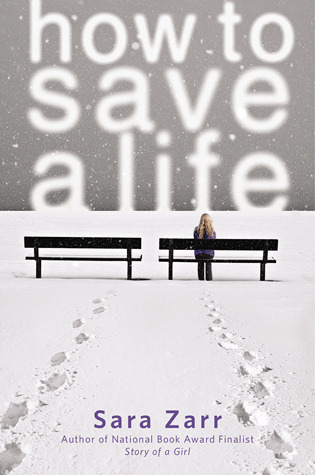 How To Save A Life isn't exceptional but it's a nice read if you're looking for something to float through. It's got a nice meaning to it and a solid plot that doesn't leave you confused. Give it a try, you might like it more than I did.